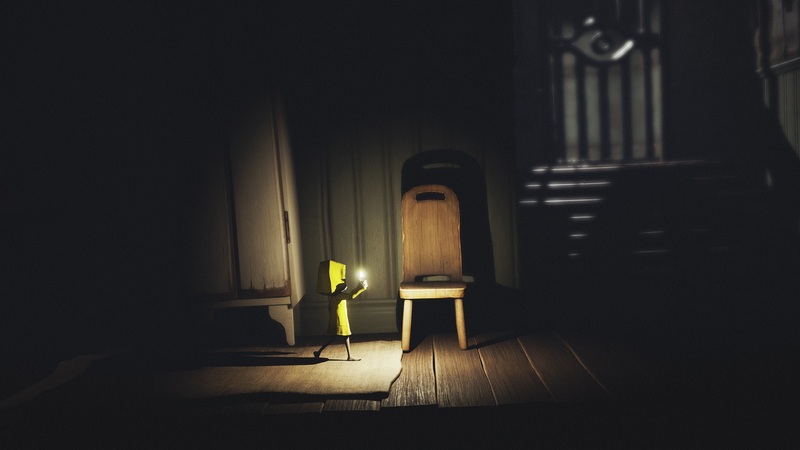 Learn how to avoid the chef, find the keys, and escape the kitchen in Little Nightmares. 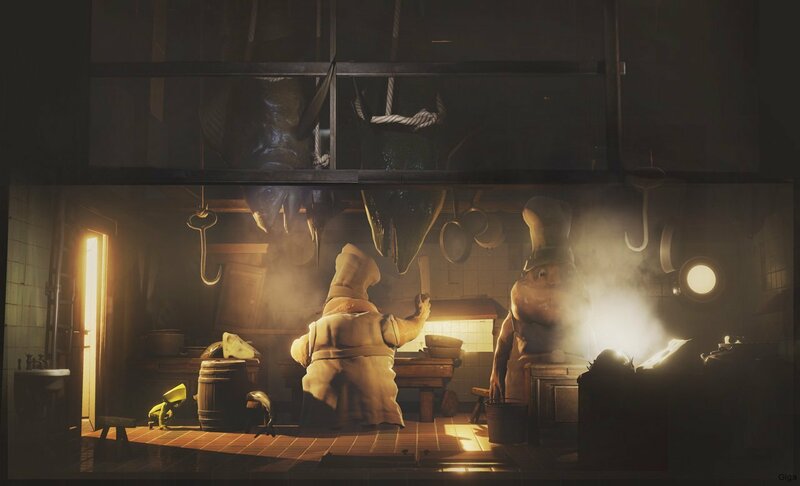 In this walkthrough of Little Nightmares, we’ll help you escape the kitchen by avoiding the chef, and help you find hidden items including Nomes, Statues, and the keys you need to move through different areas. If you are a bit behind, or simply want to double check your progress, be sure to check out our Little Nightmares walkthrough hub which contains a plethora of information about the game. Before we jump into our Little Nightmares walkthrough, it’s important to note there are 3 Nomes and 3 Statues in this section. Now that you know how many collectibles to be on the lookout for, continue on to read part 3 of our Little Nightmares walkthrough! 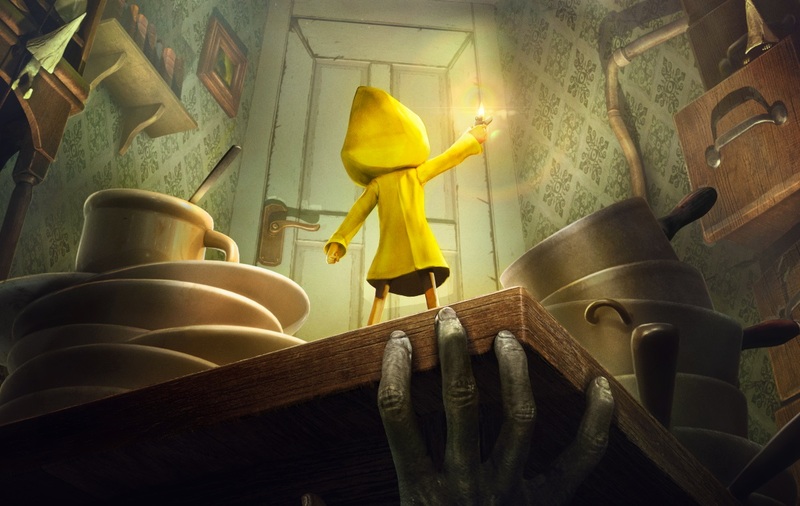 Before you move to the kitchen in Little Nightmares, you'll have to get past the laundry area. Continuing from the previous walkthrough, the first thing you’ll want to do is head to your right and climb up the ladder. On the ceiling, you’ll spot moving hooks that you can grab. To grab the hooks, run to your left, jump into the doorway, and grab a hook as it moves past you. Or, you can run to your right, climb on top of the body bag, and then grab the hook as it moves past you. Once you’ve grabbed a hook, use it to travel to the far right into the next room. Upon reaching the next room, continue moving forward as Six fights off hunger (she’ll double over in pain). When you reach the rat caught in a trap, grab it and eat it to help Six fend off her hunger. Then, climb on top of the laundry bins on your right and head into the next room. In the middle of the next room, you’ll find laundry in the center. Climb onto it, then push the metal top leaning against the bin to create a ramp over to the next bin on your right. Next, move to the floor and look in the hidden space behind the ramp between the laundry bins. There, you’ll drop into a secret passageway that leads into a room on the right. After entering the room, walk over to the table and pick up the collectible statue. Again, throw it on the floor to break it. 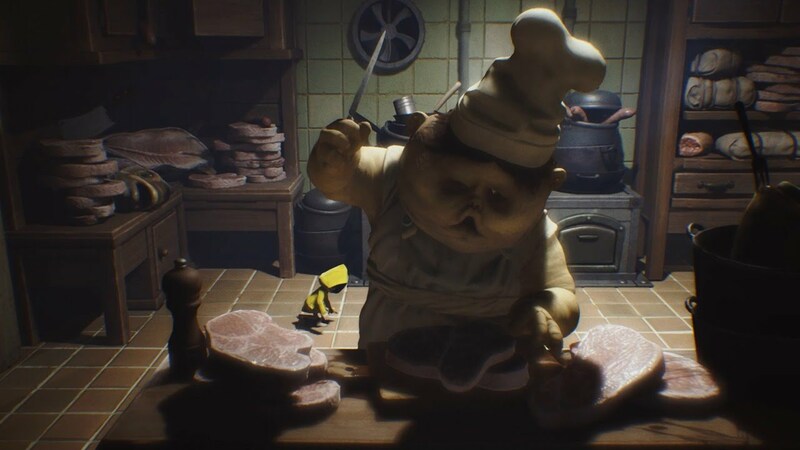 Be sure to avoid the chef in Little Nightmares as you head through the kitchen. After breaking the statue, climb up the ladder found on the wall to your right to head back into the room with the laundry bins. There, you can continue through a door on your right. Upon coming to the laundry cart, push it to the right end of the next room in order to climb on top of it and reach the opening that leads to the next area. As you continue forward, you’ll reach a room where the dastardly chef is working. Note that before that room there’s actually a small opening on the right wall next to the doorway. It’s very important that you crawl through the small opening instead of using the door, otherwise the chef will spot you. Once you’ve crawled through the opening, you’ll notice the chef moving around the room. Once he’s turned away, you’ll want to move from cover to cover until the chef heads off to the room on the right. The trick to getting up the shelving in the back is to knock things over, close oven doors, and make noise in general in order to grab the chef’s attention. In doing so, you’ll be able to move to the far right side of the room and scale the shelves in the background while the chef is busy seeking out the source of the noise. There, you’ll find a door to the right, but you’ll need a key in order to unlock it. To find the first key in this Little Nightmares walkthrough, you'll need to climb a tall shelf. Before proceeding on through the walkthrough, be sure to light the lantern found on top of the shelving, then jump to a wooden beam on your left. Rest assured that the chef can’t catch you at this point, even if he manages to spot you. With that knowledge, be sure to use the series of wooden beams to move around to the foreground, then to the left. Soon, you’ll spot a series of cages which you can climb to reach a hole in the wall near the ceiling. Move through the hole, and exit into the bathroom. In the bathroom, you’ll want to climb up the toilets and jump to the shelf on your left to light the next lantern. Continue heading left and venture into the bedroom. As you move into the bedroom, climb the shelf on the far left, then jump to grab the key needed to unlock the door in the kitchen. You’ll want to move left and right to slide the key off its hook. Be careful, though, because if you wake up the sleeping chef in the bedroom you’ll need to hide under the bed or climb up the furniture to a high spot in order to avoid being grabbed. Once you have the key, head back to the right toward the bathroom. There, walk to the background and look for a switch next to the lift. To activate the lift, jump up and flip the switch. This will cause you to drop the key, so be sure to pick it up and bring it with you into the lift as you head down to the lower level. 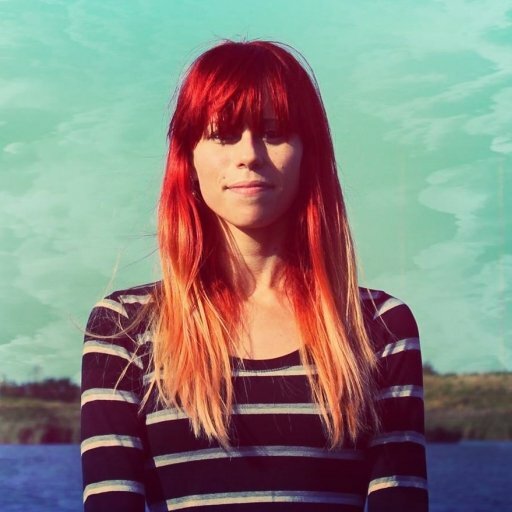 When you reach the floor below, head over to your left to spot a Nome hiding in a brown jar. Pick up the jar and toss it to free the Nome, then give it a hug. 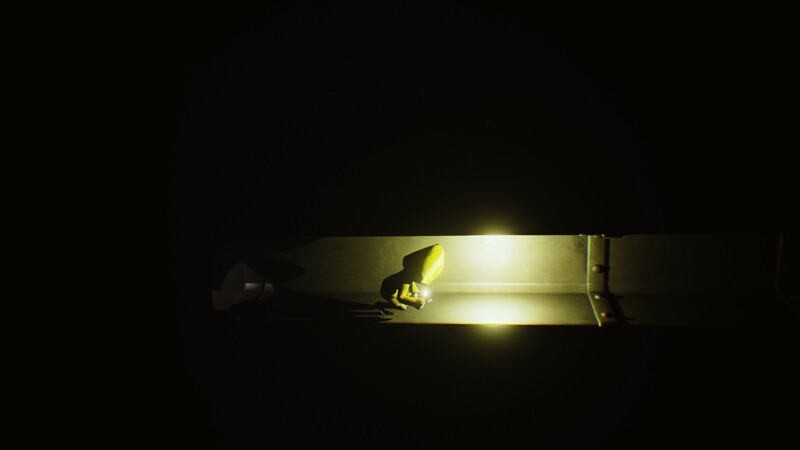 Near a food lift, you'll need to climb through the hatch in Little Nightmares. Once you’re back in the kitchen, follow the same path you did earlier while holding onto the key. Next, use the key to unlock the door on the far right before heading to the right side of the next area. There, you’ll want to climb on top of the table in the corner and use it to reach the small hole above you that you can jump up and crawl through. This will take you to another room with a table with a food machine on it. In the background, there’s a food lift, and a hatch you need to climb through up the wall to your right. To reach the hatch, you’ll first need to climb onto the table, then jump over to the handle that’s hanging from the ceiling. This will drop food onto the food machine. Now, turn the wheel on the food machine to create a link hanging to the right. Next, climb into the food lift and use it to move up to the freezer. There, you’ll want to move the food on the table to the metal hatch on the ground before heading through the small opening into the next room. Again, before proceeding forward through the walkthrough, be sure to light the lantern, grab the collectible statue, then break the statue. 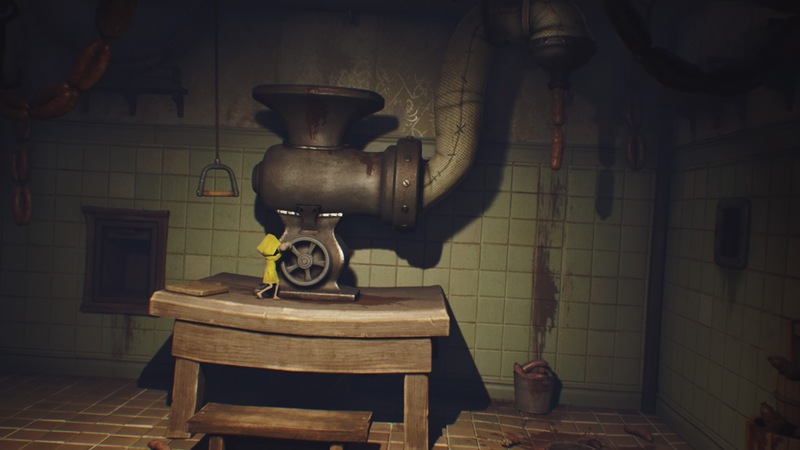 Pull the handle to rotate the wheel of the food machine in Little Nightmares. After breaking the statue, head back down the lift and head to the previous room. There, you’ll want to pull the handle and rotate the wheel on the food machine to drop the second piece of meat. Next, head back to the freezer, but this time climb the shelves on your left. Then, jump over to the hanging hook and use it to swing left and right to build momentum in order to jump to the meat hanging from a nearby hook. Upon doing so, grab the meat and let it fall to the floor, then grab it to move it to the metal hatch. Head down the lift, then repeat the process to make another link. With three links made, you can jump over the lowest one and swing to the hole on the right wall to enter the tunnel leading into the next area. As you continue forward in the walkthrough, you’ll spot two boxes stacked on the right side of the room. Remember that you can hide in the lower box! 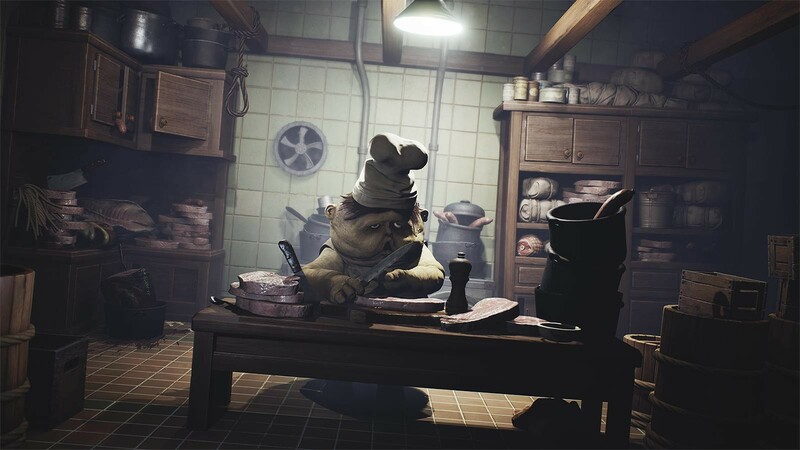 Always avoid the chefs in Little Nightmares, as they're not too fond of Six! There, wait for the chef to open the left door. After the chef moves away, head into the room on your left and hide under the table located along the right wall. The key you need to grab is on the table in the center of the room. Unfortunately, the chef is there, which makes finding this particular key in Little Nightmares rather dangerous. To grab the key, use the furniture in the back to sneak behind the chef before crawling into the hole found on the left wall. In the next area, press the button found on an appliance in the back, then quickly scurry back through the hole as the chef comes running in. Now, grab the key on the door and race back to the lift. As soon as the lift comes to a stop, run and unlock the door on your right before hiding in a toppled cart in the back. When the chef enters the room on the right, climb on top of the cart and jump over to the left to open the door to the chute. Next, climb back on top of the cart and jump into the chute to reach the level below. There, you can move to the left of the room to find another collectible statue. Again, you'll want to avoid the chefs in Little Nightmares in order to stay alive and reach the next area. After breaking the statue, climb up the right wall and move into a small tunnel on the right. In the room above, there are two different places you can go. When you reach the first point, climb out of the tunnel and up the shelves in the back. When you reach the top of the shelves, head to the left and jump over to the wooden shelf located below the moving hooks. Now, jump up and grab one of these hooks to head into the room on your left where you’ll land on a shelf. Be sure to light the lantern to earn the achievement “Light Up Your Life” as long as you’ve remembered to light every lantern and candle you’ve found in our walkthrough guides thus far. Next, jump back over to the room on your right and head back into the tunnel that runs under the floor. There, you’ll want to move to the next opening on the right and use cover to avoid the chefs as you move into the next area. Now, climb on the table and pull the lever on the wall to reverse the direction of the moving hooks. After doing so, quickly scurry under the table to avoid the chef that walks in to investigate the noise. Once the coast is clear, head back into the left room and walk to the back left and up the shelves, where you’ll reach the hooks. Use them to head to the next area on the right past the room where you flipped the lever. Next, drop down before you reach the chef. Be extremely cautious here, as all of the chefs are on the lookout for you. Here, you’ll want to be as quick as you can as you run and slide under the table. Keep running to your right, then use the box to reach the table and jump up to a hook before the chef can catch you. Finally, ride the hook to the next area on the right to complete part 3 of our Little Nightmares walkthrough. By reading through this guide, you should now be up to speed on part 3 of our Little Nightmares walkthrough.